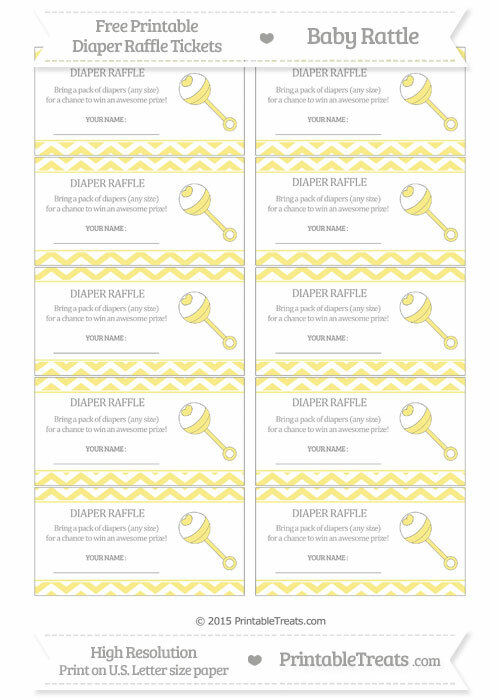 Here are some cute pastel yellow chevron baby rattle diaper raffle tickets you can print, cut, and send to guests along with your baby shower invitations. There are ten diaper raffle tickets per page that are decorated with a colorful pattern and a colorful baby rattle clipart. Print, cut, and include one or more diaper raffle tickets in your baby shower invitation and have your guests bring them on the special day to be included in the drawing for a fun prize. Don’t forget to print out the matching diaper raffle ticket signs I have posted on this site so your guests can clearly see where to drop off their tickets at the party.